One member of Libya's National Transitional Council (NTC), the rebels political body, said to me off-the-record that he disagreed with foreign military intervention in principle. "Of course I don't like it and don't encourage it, but this was our only choice. I know NATO comes with its own agenda, I know NATO is calling the shots now. After we get rid of Gaddafi, we will have to deal with the consequences of NATO intervention." In the Vietnam War the U.S. faced a people that had already liberated half of their country and were intent upon sweeping the French and U.S. backed puppet regimes aside and liberating the other half. Contrary to U.S. claims at the time, they knew that "the battle for Hearts and Minds" had been lost a long time ago. 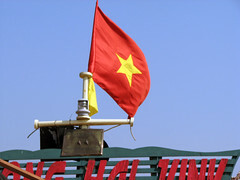 They had the Diem regime cancel promised elections in 1956 because the CIA reported that even in the South, Ho Chi Minh would get more than 80% of the vote. His approach to fighting the war in Vietnam was essentially that if he killed enough of the enemy, the war would be won and he killed an awful lot of them but the war wasn't won. This campaign resulted in the slaughter of more than 3 million Vietnamese and most these people were killed in a bombing campaign, the intensity of which had never been seen before or since. It was the equivalent of 640 Hiroshima sized atomic bombs. I did a film documenting this human slaughter, Vietnam: American Holocaust, and a 10 minute segment on the bombing of Vietnam has been viewed 637,031 times on YouTube. In Iraq and Afghanistan the U.S. has also been waging a war against an insurgency. Since insurgents tend to live among the people, with their families and other civilians, and since U.S. war planners disregard that reality, these campaigns have also involved high civilian causalities even if they haven't brought back the murderous carpet bombing campaigns of the Vietnam era. Is it like that also in Libya? Is NATO running true to form with NATO bombing resulting in high civilian causalities? One would think so, if history is any guide. Or is it even worst? Possibly a slaughter from the air on a Vietnam scale? Some see it that way. Speaking on the ANSWER sponsored Eyewitness Libya tour in Los Angeles, June 18, Cynthia McKinney condemned the NATO bombing of Libya. She was witness to the bombing of Tripoli and said "Tripoli is under heavy aerial bombardment in all areas, in civilian areas." That certainly sounds like the type of bombing I document in my film on the Vietnam War. Official NATO sources say that more than 10,000 sorties have been flown over the oil-rich nation resulting in large-scale destruction of the country’s infrastructure and the reported deaths of 10,000 to 15,000 people. On Wednesday, Libya’s prosecutor general accused NATO of killing 1,108 people and wounding another 4,500 and filed charges against the alliance’s chief in Libyan court. On July 4th the official Russian website Pravada spoke "of hundreds of casualties from the bombing of NATO since March 19 last." But even these numbers are hotly contested by NATO and they may be right. Unless you believe that NATO is just out to kill Libyans in massive numbers, which case a few hundred thousand could easily be killed in Tripoli alone, there is reason to believe that civilian causalities in this conflict might be significantly lower than they were in the previously mentioned NATO and US bombing campaigns. For once, NATO is attacking a state actor and a state army, not an insurgency. While insurgents live among the people and the imperialist will readily disregard "collateral damage" to get at them, state armies generally live in barracks and state run military installations, for a variety of security and other reasons, tend to be away from population centers. This means that if those are indeed the targets, and a little care is taken, civilian casualties can be minimized. However, as we well know from on-going wars in Afghanistan and Pakistan, they are not squeamish about "collateral damage" if they think they have even a shred of a chance of killing what they consider a "high value target", so any civilians around Mummar Qaddafi or anyone else at the top of his regime's military or political leadership would undoubtedly be in grave danger. It was a small whitewashed suburban type house in a typical residential area in metropolitan Tripoli. It was surrounded by dozens of other family homes. I spoke with a neighbor who described how three separate smart bombs hit the home and exploded, another one not exploding. According to the BBC, the NATO military operations chief stated that a "command and control center" had been hit. That is a lie. As anyone who visits the home can see, this home had nothing to do with NATO's war. Muammar Qaddafi was at the house. But he was outside near where the animals are kept. It is a miracle that he survived. From the looks of that house and the small guest house beside it, the strike was a complete success if the goal was to totally and thoroughly demolish the structure and everything inside it. Since no other deaths or destroyed buildings were reported as a result of this strike, it also sounds like it was a complete success in not hitting anything they didn't intend to hit and since Qaddafi was there at the time, it sounds like it was based on good intelligence, neither are necessarily the norm when it comes to NATO operations. But they missed him nevertheless. One thing that Cynthia McKinney should understand is that that home, with Mummar Qaddafi in it, was a legitimate military target in the eyes of NATO. It may not be legitimate to kill a head of state in war but it is legitimate to kill a soldier in the opposing army, even a colonel, and especially if he is the top commander and the principal threat to the civilians NATO is authorized to protect. NATO has clearly been targeting Mummar Qaddafi for assassination in some of these air strikes and all denials to contrary can be disregarded. Me, if I knew, say, that the Mafia had a hit man out trying to kill me, I wouldn't be anywhere near my family. But that's just my speculation about a hypothetical situation. Each person and each family would have to decide for themselves how they might deal with a threat from a mad dog. In any case, the one thing we know from this April 30th air strike is that the NATO air strikes on Libya have killed civilians, including children. Beyond that we have these wildly different claims as to how many. One of the eye-opening features of the three month old NATO air campaign in Libya is the hollowness of the world’s premier military alliance, the North Atlantic Treaty Organization (NATO)... The Alliance publishes daily statistics of sorties flown and strike missions conducted. Of course, the vast majority of those strike missions are unsuccessful meaning that the aircraft went out armed and came back without having expended any ordinance. In the vicinity of Brega: 2 Armed Vehicles, 1 Rocket Launcher. In the vicinity of Misrata: 2 Rocket Launchers, 3 Armed Vehicle. In the vicinity of Tripoli: 2 Surface-to-Air-Missile Launcher, 1 Radar. In the vicinity of Waddan: 1 Military Storage Facility. In the vicinity of Brega: 5 Armed Vehicles, 1 Armoured Fighting Vehicle. In the vicinity of Misrata: 1 Anti-Aircraft Gun, 2 Armed Vehicle. In the vicinity of Tripoli: 6 Surface-to-Air-Missile Launcher, 2 Armed Vehicles. In the vicinity of Brega: 8 Armed Vehicles, 2 Armoured Fighting Vehicles. 1 Command and Control Vehicle, 1 Command and Control Node. In the vicinity of Misrata: 6 Artillery Pieces. And so it goes with NATO bombing, day in, day out, for four months now. In reading these sterile stats, it would do well to bare in mind that the home where they missed Qaddafi, the home where they killed the children, would have been listed in the NATO report as "1 Command and Control Node." The U.S. participation in this warfare seems relatively modest for a superpower. AFRICOM spokeswoman Nicole Dalrymple said in a statement on June 29th. “As of today, and since 31 March, the U.S. has flown a total of 3,475 sorties in support of OUP. Of those, 801 were strike sorties, 132 of which actually dropped ordnance.” That was only 16.1% of the 4,963 strike sorties conducted by NATO as of June 29th with a total of 132 targets being hit. Cynthia McKinney recalls the terrifying aerial campaign of the Iraq War when she speaks of "the shock and awe of NATO bombs and missiles" in Libya, but these numbers are still a long ways from the 38,358 sorties flown by U.S. aircrafts or the 29,199 munitions dropped on Iraq in the first 30 days of that war which started on March 19, 2003. NATO has admitted killing Libya civilians by accident in at least one case. On Sunday, June 19th, 15 civilians, including 3 children, were killed by a NATO bombing attack to the west of Tripoli according to Libyan officials. A NATO statement said, "A military missile site was the intended target of air strikes in Tripoli last night. However, it appears that one weapon did not strike the intended target; there may have been a weapons system failure which may have caused a number of civilian casualties." There have also been a number of so-called "friendly fire" incidences that the rebel forces have reported and that NATO has owned to, beyond that there is controversy. A NATO air strike 15 kilometers east of Brega on April 1, killed 9 rebels and 4 civilians. "Thirteen dead, seven injured by friendly fire. It was a regrettable occurrence," rebel Abdulhafiz Ghoga said, calling them "unintentional deaths." Another rebel spokesman, Mustafa Gheriani, told Reuters the leadership still wanted and needed allied air strikes. "You have to look at the big picture. Mistakes will happen. We are trying to get rid of Gaddafi and there will be casualties, although of course it does not make us happy." But at the same time there was growing frustration with NATO. On April 5th, Libyan rebel military leader Abdel-Fattah Younis spoke out publicly saying that NATO was falling short in it's mission to protect civilians. He also said the rebels had been routed from Brega because NATO was slow to conduct air strikes. They didn't "do anything", he said. A lower ranked soldier of the campaign, Pvt. Mohammed Abdullah, a 30-year-old former member of Qaddafi's army who has joined the rebel side, complained "NATO is not doing their job, the air strikes are late and never on time. NATO is not helping us. Qaddafi still gets ammunition and supplies to his forces, that's why he is pushing us back." NATO holds its fire as Moammar Gadhafi's forces advance 100 miles into rebel territory. It then blasts a rebel tank, saying it didn't know the rebels had any – even though footage of rebels with tanks had been on YouTube for weeks. As the bodies of the fighters who had been killed were being collected at a medical clinic in the Qasr Ahmed neighborhood, a grieving rebel commander, Abdullah Mohammed, provided an account of the errant strikes. Mr. Mohammed said that as pro-Qaddafi forces tried to outflank the city’s port from the east in recent days, rebels moved into a salt factory and fortified it as a blocking position. They first occupied the building on Tuesday, he said, and informed NATO of their presence. For it's part, NATO has complained that these incidents and some others involving civilians could be greatly diminished if the rebels would allow NATO to have it's own forward air controllers on the ground, but the rebels see that as a violation of their prohibition against foreign boots on the ground. In any case the lack of these incidents since April would seem to indicate that the necessary co-ordination has been achieved without the introduction of NATO boots on Libyan soil. In late May, the British government declared that it had used precision-guided weapons to bring down guard towers at Gaddafi’s Bab al-Aziziyah compound and said that the Libyan regime would no longer be able to hide behind “high walls” to spread terror and crush opposition. A trip to the area the following day showed the towers and the walls still intact. So for all the fanfare that accompanied NATO's entrance into this conflict, and all the decrying of NATO's 'massive bombing' by Qaddafi supporters, NATO's real contribution to the fight to overthrow Qaddafi has been less than you might think. There have also been a series of what looks like decapitation attacks as NATO pounded what they called command and control centers in and around Tripoli after the failed attempt on Qaddafi that Cynthia McKinney spoke of. On May 10 NATO carried out eight strikes in less than three hours in "an unusually heavy bombardment of Tripoli." Libyan authorities reported that four children were injured by flying glass as a result. "Two of the children were seriously hurt and are in intensive care in hospital," said one official. Two days later, May 12, they struck Qaddafi's sprawling Tripoli compound and three other sites only hours after Qaddafi had surfaced on Libyan State TV. Libyan officials said 3 people were killed and 25 wounded as a result. At this rate, the rebels will probably get Qaddafi before NATO does. We now know that the "kitchen explosion" reported by Libyan government spokesman, Moussa Ibrahim, yesterday was a little more than that. According to Ali Essawi, who is in charge of Foreign Affairs for the NTC, there was meeting in a room of top Gadaffi officials when it was struck by a rocket propelled grenade. People in the room at the time included Gaddaffi’s youngest son, Saif al-Islam, his Prime Minister al-Baghdadi Ali Al-Mahmoudi, his Intelligence Chief Abdullah al-Senussi (wanted by the International Criminal Court) and an official called Mansour Daw. It is believed that Daw, a former Gaddafi bodyguard and now a close aide, was the one seriously injured. The others escaped unharmed or with minor injuries. TRIPOLI, Libya — Eleven Muslim clerics were killed in their sleep by a NATO airstrike Friday on the eastern oil town of Brega, a Libyan government spokesman said. The spokesman, Moussa Ibrahim, says the clerics were among a large group of imams who had gathered in Brega to pray for peace in conflict-ridden Libya. He said 11 imams were killed and 50 people wounded, including five in critical condition. @clayclai No Imams were ever killed. Those were clearly Gaddafi's officers in Brega C&C. Imams don't wear Fly Emirates shirts & sports wear. In a Tripoli hospital, the Gaddafi regime's propaganda attempts are cruelly exposed as Libyan government officials present a baby girl as a victim of a Nato airstrike only for it to be revealed that she was injured in a car crash. On Sunday, journalists were taken to look at some broken windows in a church but were not allowed to visit a nearby military site that had been destroyed. Then they were taken to a farm and shown a dead dog and dead chickens. A man there said no humans had been injured, but that story changed by the time the journalists reached the Sharia al-Zawiyah hospital. As the baby slept, a man arrived at the bedside and was introduced first as a Health Ministry spokesman, and then as a neighbor of the family. A few hours later, in the early hours of Monday, the journalists were taken on another trip, to a different part of town, to see a rusty rocket lying in a field behind some houses, a wooden picnic table overturned and a furrow gouged in the earth. “Were there any civilian casualties?” one reporter shouted. “Look, the table,” an official replied. A family emerged, and the reporters were told that they were having “lunch” in the field when the rocket struck around midnight. Then, Gheith was spotted. Pressed on why he had come here, he eventually admitted that he was a Libyan “journalist” who worked for the government’s media operations team. Then, as he explained that the rocket had fallen from the sky and gestured at the NATO warplane still audible overhead, a reporter saw Cyrillic lettering on a piece of the rocket, which looked more like part of a Russian Scud than a NATO missile. The story quickly changed. Perhaps NATO had bombed a Libyan military site and this rocket was part of the debris, Gheith suggested. It feels like some vast piece of political improvisation, with the participants just riffing off the central theme — NATO is killing Libyans, all of whom love Gaddafi — without any regard for the truth. The day after NATO admitted to an error that left 15 civilians dead, July 20th, Libyan authorities accused NATO of killing 15 civilians including three children in a NATO attack on a compound owned by long-time Qaddafi associate, Khoweildi al-Hamidi. On June 25th, the Libyans accused NATO of killing 15 people, saying an airstrike hit a restaurant and bakery in Brega. An unknown NATO official denied these reports, saying "We have no indications of any civilian casualties in connection with these strikes." On June 29th, Libyan State TV said that a NATO airstrike had targeted a market in the town of Tawragha had killed 8 civilians. Thus within ten days of NATO owning an error that cost 15 civilian lives, the Qaddafi government accused them of taking 38 more but NATO didn't take responsibility for these. Nearly three months into NATO’s bombing campaign, Moammar Gaddafi’s government churns out daily propaganda about the alliance supposedly inflicting civilian casualties. Last week, it said that 718 people had died from mid-March to late May and that 4,067 had suffered significant injuries. But it has failed to show foreign journalists more than a handful of dead or wounded people. Indeed, when reporters are taken on official trips, what they see suggests that NATO is being accurate and careful. On her nationwide "Eyewitness Libya Tour", Cynthia McKinney shows a film produced for her by "ordinary Libyans." In that film, we are shown dozens of what we are told are civilians injured by NATO bombing. I found it interesting to note that all those that we are shown are men of military age. If over a thousand civilians have been killed by NATO bombing, there should be many women and children among them. Why were they absent from the video? So how many Libyans has NATO bombing killed in Libya? It is definitely more than the 60 of so that NATO has owned to and almost certainly less than the more than 1100 claimed by the Qaddafi regime. We won't know until peace comes to Libya and we may never know for sure. In any case it is far less than the estimated seven thousand Libyans Mummar Qaddafi has killed in attempting to suppress this uprising since February 15, 2011. Far fewer Libyans have died in the 4 months since NATO intervened in this conflict than in the four weeks before they did. Speaking on 14 July, Stefan de Mistura, special representative of the UN secretary general for Afghanistan, and his colleague Georgette Gagnon – director of human rights for the mission – described a 15% increase in civilian casualties in the preceding six months, with May 2011 the deadliest month of the war for civilians since 2007. They have documented 1,462 civilian deaths in the first six months of 2011 in the war in Afghanistan, at the same time U.S. officials claim NATO special forces raids have killed 834 "insurgents" just since April. Even if anti-government forces are responsible for 80% of the civilian deaths, as the UN report claims, NATO is almost certainly still killing more civilians there than in Libya. Perhaps those that are trying to re-task the antiwar movement to put opposition to attacks on Qaddafi in first place would do well to consider this. This is how some in Tripoli feel about NATO air strikes on their city. "We thank the US and France for what they are doing. But they have no say here in things. They should just give us the air cover we need to march to Tripoli. We Libyans will do it ourselves. We shall liberate Libya from the tyrant and we Libyans shall decide his fate". Foreign ground troops are out of the question for now. Signs in many parts of Benghazi clearly state they are not welcome. What rebels hope for is to get weapons, aid and money from friendly countries to help them make it to Tripoli. Qatar has already sent two batches of military and humanitarian aid but other countries are yet to do their part.